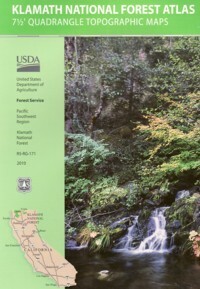 The KLAMATH FOREST atlas, is a spiral bound book – a collection of all the quads. (7.5 minute topographical maps, of all of Klamath National Forest back country) This book map has detailed topo lines, mountain peaks, streams, lakes, hiking trails & back roads. Perfect for all kinds of recreational needs.